October 3, 2018 – Using the NASA/ESA Hubble Space Telescope and older data from the Kepler Space Telescope two astronomers have found the first compelling evidence for a moon outside our own Solar System. 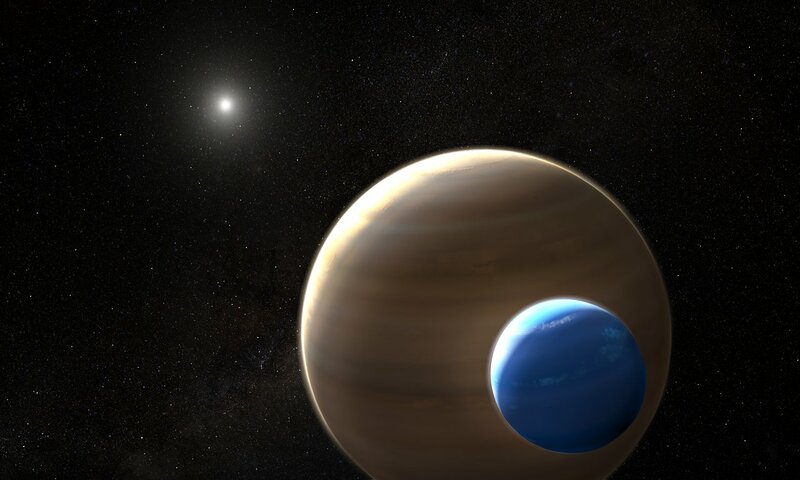 The data indicate an exomoon the size of Neptune, in a stellar system 8000 light-years from Earth. The new results are presented in the journal Science Advances. In addition to this second dip in the light curve, Hubble provided compelling supporting evidence for the moon hypothesis by detecting the planet’s transit more than an hour earlier than predicted. This is consistent with a model of the system in which the planet and its moon orbit a common centre of gravity, causing the planet to wobble away from its predicted location.